WordPress is a great content management system (CMS), that has changed the game for online marketing and allowed so many new people to become bloggers and webmasters. But, it is not without fault, like anything else in the world and there are some things you should know to make your experience as an online marketer better. Back in the 90’s and even early 2000’s, most websites were more static then they are today. Some websites were even written in html by hand coding. Then, came along software like Dreamweaver and Microsoft Front page. These were the start of making things easier for people to start websites. But, something still lacked in the industry and it needed something to make things even easier. So, in 2003 Matt Mullenweg created and released WordPress and things were forever changed. Wordpress is a complex but yet easy to use cms for webmasters. Most people just getting into something like affiliate marketing will usually choose it because it can be so easy to setup and write your first article. But it doesn’t always go that way when you are first starting to use it and there can be a learning curve. So, here is a handy little guide to WordPress for anyone who wants to use it to it’s fullest potential. While website design and a professional look can be very important, getting your message across with content is your ultimate goal. And, content will be the number thing you will be creating while using a system like WordPress. So, always learn as much as you can about things like WordPress, seo, cro, traffic etc. But, if you are new it will take some time to learn these things. But, for now let’s say you are putting up your first website and using this awesome cms and your no doubt have questions. So here are so of the important things when you are first getting started. Straight out and in the open, Wp can be a terrible nightmare when it comes to seo. But, fortunately it can be manipulated in a way that makes sense for search engine optimization. It usually also depends on what theme you are using and or plugins. It’s best to use plugins designed for seo like Yoast Seo or the all in one pack plugins. either one of these two plugins are essential to getting seo correct for WordPress. There are other but these are the top two these days. One of the biggest problems with WP is, it creates duplicate content with it’s tags and categories. And, while some may recommend using these and leaving them open. I myself do not usually. It all depends on what the categories are though. The more categories and tags you create within the system, the more chances you have for duplicate content. So, make sure you pick a theme that will play nice with either one of these plugins and allow you to take full advantage of them. If you will be relying on search traffic, this is important. You will want to configure each one also. You will need things like a sitemap and breadcrumbs from the plugins. Breadcrumbs are not necessary but, can be very helpful to a search engine. You just have to be careful your breadcrumbs are not creating keyword over optimization on your site however. If you are using Yoast seo, you can read their install and use guide. One thing you will want to keep a watchful eye on when using Yoast, is the sitemaps feature. There has been a problem with this for a while now, where the sitemap get wiped out and you have to either re-save it from within the plugin or or re-save your permalinks to fix the problem. One day you will be searching your Google Webmaster counsel account and you will see your sitemaps stating zero pages indexed. If this is the case, check the Yoast sitemap feature of the plugin. Website speed is very important. Not only to keep Google crawling your site correctly, but also for your users. No one likes a slow websites and the average user will wait only a few seconds for a page to load. Having a speedy website helps with conversions and everything else in between. You will also want to use a cache plugin to help with your blogs speed. The 3 most used today are: Wp-Super Cache, Wp Total Cache and Zencache. Each one has it’s advantages and disadvantages. But they are all very useful for speeding up the WordPress experience. You may find yourself switching between the 3 because each one can have problems with other plugins, server etc. And, your work is not done just because you set everything up and started writing your pages. You will need to go into your Google or Bing webmaster accounts and check individual pages for speed problems. A page can have a problem for many different reasons. It could be a plugin conflict, a resource you used on your page, such as a YouTube video, your server or somethings else. So, always make sure your cache plugin is playing nice with everything as you go along and create your website. Picking a good quality theme is important also. You don’t just want something that was coded like junk. Picking such a theme, can really slow down your website. So, always looks for theme that are well coded and follow all html industry standards. It only makes sense, if you have to shell out a few bucks in order to accomplish this. There are many good themes on the market today. I tend to usually use Studiopress genesis as my theme and framework of choice. The reason I use a framework is everything else is there I need like pagination choices and more. The only problem with using a platform such as Genesis is, you are limited to their designs or whatever designs you can find if you can’t code. But, if your just starting out it’s not a bad choice as you will mostly be focusing on your content in the beginning. WordPress is defiantly not without technical issues. Again, if you are just starting to use it, these will be ups and downs you will go through especially on the technical side. New users can often break themes from installing way too many plugins. If you do have problems after installing a plugin, don’t panic as usually you can go in and disable your plugins folder and get everything working again. If you are not sure how to do this, call your web host and they will help you. Always think lean and mean when it comes to WordPress. While there are very useful plugins that can really help with marketing your website. Loading way too many is done by many and usually most beginners. And, if you have a slow blog and have a good caching plugin configured properly, always check your plugins. Some plugins call so many requests to a My sql server it’s not funny. Most cheap hosting providers will not show you these things. But again, you can always call them and ask them to run a plug in report to check if any plugin is bogging down your site. Last but not least on this list is finding a good web host. There are so many hosting companies out there today it can be hard to choose one and find one who offers quality. If you are just starting out you really don’t have to worry too much unless your blog is dead slow. You can also, always switch up later to a better server or host after things get going and if and when you figure out is blogging for you. Many cheaper hosting providers do not really care as long as you give them money. So just beware. You will want to check what other recommend and start there. You can check out my page for more information about web hosting. 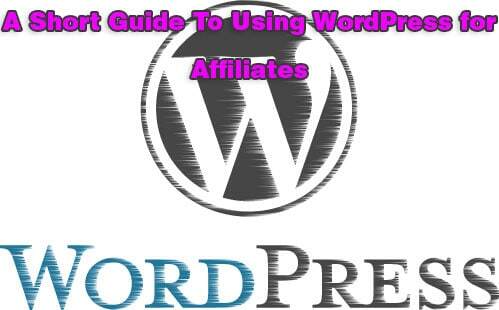 WordPress is a great system for pros and beginners alike. You just have to learn how to Manipulate it properly to get the most out of it. And, if you are new, take your time and learn all you can. There will be issues you will have along the way. So choosing a good web hosting company can make all the difference.